Old or brittle fingerboards can turn a simple refret into quite a tedious job. 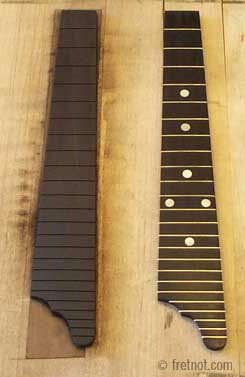 Patience is necessary when removing frets from a fingerboard, even more so when the fingerboard is brittle. Although chipping is unavoidable on some fingerboards I feel it is essential that they be repaired when refretting. Fine line cracks can develop in the fingerboard and stretch a distance of several frets. These are often spotted when cleaning the fingerboard and can be an indication that the instrument is dry and in need of humidity. If you see cracks develop in the fingerboard make sure the instrument is properly humidified. After properly cleaning the fingerboard, fine cracks can be filled with wood dust and adhesive. The fill is then leveled and the boards finely sanded. I personally find the easiest locator pin is simply a drill bit turned upside down as the hole and the pin must match exactly to keep the board from moving when gluing. Shell inlay can be removed by heating with the tip of a soldering iron or other, pinpoint heat source. Once the glue is soft pressure on the edges will cause the inlay to teeter and allow you to either get a grip on the piece or slide under it. Celluloid inlay is flammable and should not be subjected to direct heat. I usually warm these slowly from a hair dryer to avoid destroying the inlay.